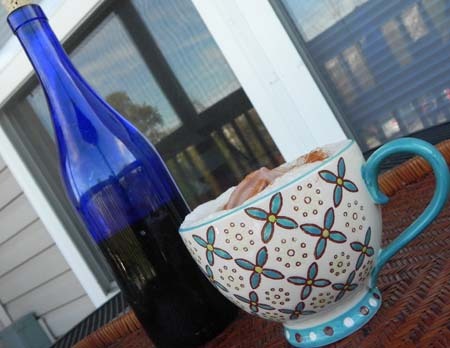 Homemade Pumpkin Spice Lattes–sans espresso machine! 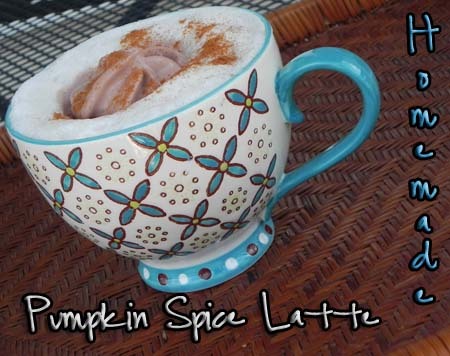 Okay, so I know this fall there have been about a zillion variations of DIY pumpkin spice latte recipes online. 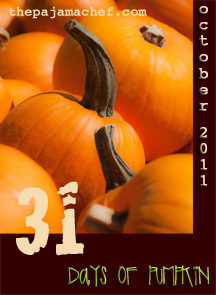 But I kept making excuses for making them, even though I was craving that pumpkin spice-flavored syrup. I didn’t have any cinnamon sticks [remedied with a trip to Sam’s… big jar for under $4! Apparently sticks > ground.] or any cheesecloth [it’s $2 at the grocery store], and lastly, I certainly didn’t have a fancypants espresso machine. No way to get steamed milk. Ummm… yeah, can’t get past that obstacle for cheap. Or can you? A little googling and apparently some Mason jar-shaking action has somewhat of the same effect. Not exactly the same, but close enough. I was quite impressed with myself after testing out that googled solution. Thankfully I’ve been working out! I combined that milk with some fall-spiced pumpkin simple syrup I cooked up in a jiffy, freshly brewed espresso blend coffee, whipped cream, and cinnamon and had myself a nice, fancy coffeeshop-worthy beverage. If you don’t want to go to all the trouble of a DIY latte and would rather leave that to the professionals, this syrup is also fabulous stirred into coffee, hot chocolate, and probably even ice cream [though I haven’t tried it yet]. It’s easier than you think–I promise! Stir together water and sugar in medium saucepan set over medium-high heat. Stir from time to time until sugar dissolves. Add cinnamon sticks and whisk in spices, then stir in pumpkin puree. Cook for 5 minutes, stirring continually. Do not let mixture boil. Remove from heat and cool for 15 minutes. Then, strain syrup through a cheesecloth and store in the refrigerator in a sealed container. To make latte, pour milk into a Mason jar, screw on lid, and then shake for 60 seconds. Then remove lid and microwave for about 60 seconds or until hot, transferring to a larger container or bowl if necessary. [I did this so that it wouldn’t overflow.] Pour into a large mug and stir in coffee. Drizzle in pumpkin spice syrup then top with whipped cream and cinnamon as desired. I definitely want to try this though! Yum! Homemade pumpkin syrup? How cool! I’m totally impressed! This looks great! i haven’t gotten one of those all year… tragic. Okay so, not only do I love the sound of these lattes but I also love all of your ideas for that simple syrup! I’m thinking some pumpkin swirl ice cream is in order. Yum! I love my homemade syrup too (very much like yours, sans the ginger). And I’m tempted to buy one of those little electric whisk thingies to foam up my milk.